He also expresses his gratitude for the student AV unit: “They’re a huge help to us because we can’t be in two places at one time…If it’s an all student event, we like them to take the lead as well, I don’t think anyone likes to be barked at. Every year during recruitment, we wonder if there’ll be anyone who wants to join the student unit, because it’s a backstage thing without much recognition. But so far every year there are students who join. We work well together – they’re very enthusiastic.” Together, they work to plan the programmes for school concerts such as CultuR Shock! based on both lights and stagehanding requirements, factoring in the segments for which props need to be moved and curtains need to close. 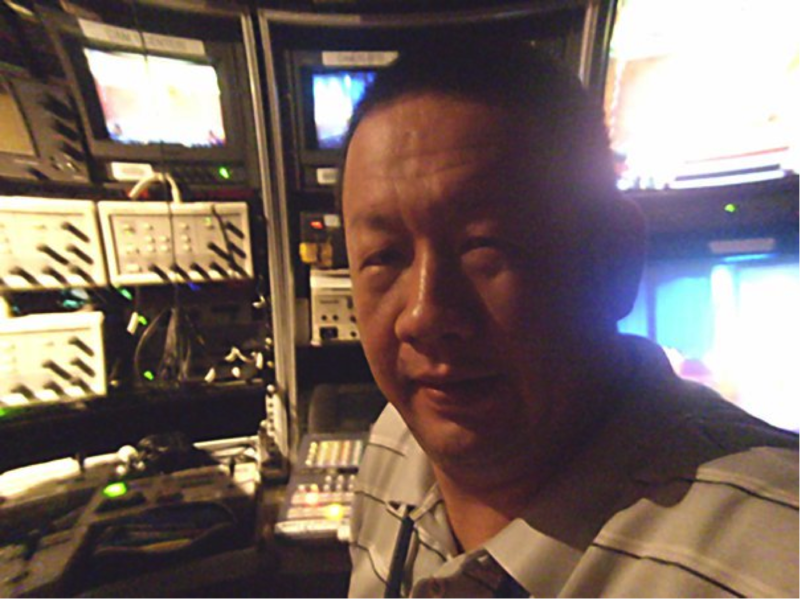 “Prep is half the battle, no matter how good the show,” Mr Lim asserts. Nowadays, he knocks off at around 4pm, and leads a more leisurely pace of life. The main reason why he came to work at Raffles was in fact so he could spend more time with his family. (“Working all those shows, the missus got angry.”) When asked, the father of two sons says he doesn’t have any hobbies – “Just the kids. A lot of effort and time is invested in the kids.” Together with his wife, who is part of the British Airways cabin crew, they ‘try to make sure that besides school, they have recreation as well’, and take them for swimming and taekwondo classes, as well as to the park on the weekends. “We’re just your average middle class family,” he says modestly. It seems he has the rest of his life all figured out, and when we ask him – somewhat tentatively – if he sees himself moving on, his answer is immediate: “I don’t, because I’m happy here. I love the people I work with: the lab, the library, ITU (IT Unit). Everybody is very nice. If you work outside, people get very mean, but here everyone works as a team.” Besides the people, his favourite place in Raffles is the library. “I don’t get to go there much, but I get to service the projectors sometimes. It’s just the stateliness of that place. It just feels damn shiok (Malay exclamation of satisfaction) lah,” he enthuses. For someone who is comfortable with working unnoticed behind the scenes, he leaves a deep impression on our minds – that of a person simultaneously driven and humble, passionate and pragmatic, affable and straight-talking. If you ever get the chance to work with him and his Estate (AV) crew, do drop him a thank-you note; if you see him in the corridors, do stop and say hello. This is the last of our Appreciation Week articles for 2014, brought to you by Raffles Press and The Humanz Initiative (THI). We really appreciate your support for this initiative, and we hope that you will go beyond just this week to show your gratitude for the non-teaching members of staff who deserve a lot of thanks for the work that they do.